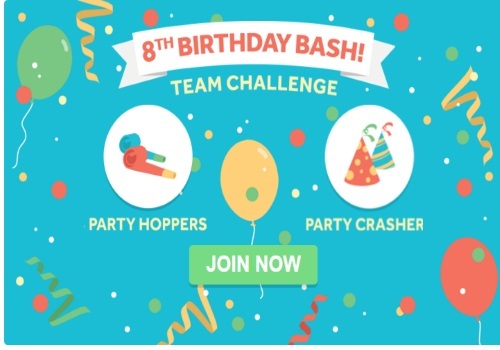 Swagbucks has a new Team Challenge for their 8th Birthday celebration bash! You can pre-register now and the challenge officially starts on midnight February 25, 2016. The Birthday Bash begins on our 8th Birthday, Thursday, February 25th at 12:01am PT/3:01am ET and ends at 5pm PT/8pm ET! We know that’s a long party but we’re feeling ambitious. We’ll try to pace ourselves, but you only turn 8 years old once! All members who participate and contribute at least 200 points to their team’s total will be receive a SB bonus in the form of a SB Swag Up Rebate! Members of the 1st place team will receive a 100 SB Swag Up Rebate, members of the 2nd place team will receive a 50 SB Swag Up Rebate! CRAZY 8 BONUS ALERT! Join the Team Challenge for the opportunity to earn a slew of additional 8 SB Bonuses between midnight and 5pm PT/8pm ET on February 25th! You MUST join the Team Challenge to be eligible to earn these 8 SB Bonuses though! Discover - Earn a 8 SB Bonus when you complete a Special Offer from our curated 8th Birthday Bash Discover Offers. Make sure to stay tuned for the end of the Team Challenge! The eighth and final Swag Code of the Swag Code Extravaganza will be revealed right here at party headquarters, the 8th Birthday Bash Team Challenge page. It’ll be revealed in a puzzle though so don’t go too crazy! *All 8 SB Bonuses and SB Swag Up Rebates will credit by 8pm PT/11pm ET on February 25th. If you're already a Swagbucks member, click here to be assigned to a team. This will randomly place you in one of the teams.